Medical assistant training may provide a career path into the allied health field as well as the healthcare industry. In addition to that, medical assistant training may also provide you with the necessary skills and tools sought by employers. If you are still in high school and you are interested in becoming a medical assistant then it is preferable for you to take courses such as anatomy, biology and chemistry. However, employers have a high preference for those seeking to become medical assistants, to have completed their postsecondary medical assistant training programs. Medical assistants carry out administrative and clinical tasks to help out both doctors and patients alike. Students normally take a year to successfully complete their medical assistant training programs. These are offered by a wide variety of colleges, universities, community colleges and, training and technical schools. These programs in the United States normally result in a diploma or a certificate in a related field. 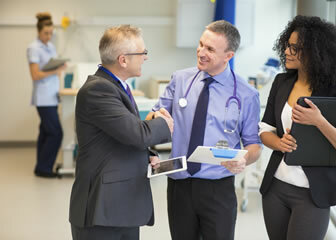 Several community colleges and junior colleges in the United States offer two-year programs in medical training or medical assistance and this may lead to an associate’s degree. All of these programs, in addition to classroom instruction, provide laboratory access to students. In most states, there are no set educational prerequisites for becoming a medical assistant. However, a few states may require assistants to graduate from an accredited program, successfully clear an exam, perform various advanced medical tasks, such as administering and taking injections and x rays etc. In some cases students acquire a high school diploma or equivalent to apply for medical assistant positions in hopes of learning their duties and responsibilities on the job. Medical assistants without relevant postsecondary education get their training, develop their skills and learn their tasks on the job. Physicians, doctors and experienced assistants may help a new medical assistant in understanding how to perform daily clinical tasks, medical terminology, how to handle medical instruments and the familiarization with different types of medical equipment. Medical assistants may also learn to record patient information and how to compile and manage both electronic and paper health records. It may take you several months to complete your on-the-job training. Normally, being certified is not a set prerequisite to become a medical assistant, though employers generally tend to hire medical assistants who are certified. Various recognized organizations provide certification for medical assistants. Some certification bodies require the assistant to successfully clear an exam, while others require the assistant to graduate from an accredited program. In hospitals or larger practices, medical assistants may be required to specialize, so they may be able to perform various tasks. These medical assistants fill our insurance and other medical forms for patients. They also manage patient appointments and attend phone calls. Administrative medical assistants may also be required to store, maintain and buy medical equipment and other supplies for the clinic or hospital. These assistants may be required to do clinical tests, sterilize medical equipment and dispose contaminated equipment and supplies such as used injections. In addition to this, clinical medical assistants may also be required to prep patients for x rays, drawing blood, removing stitching, changing dressings or instructing patients about medication and special diets. Podiatric assistants work with podiatric doctors or foot doctors. These assistants develop and take x rays, make feet castings and assist podiatrists in surgery. These medical assistants help ophthalmologists and optometrists. They help the patients in learning how to remove, care for and insert contact lenses. These assistants may also assist ophthalmologists in surgery. Medical assistants are expected to understand and analyze medical charts and diagnoses. You as a medical assistant may also be required to code a patient’s medical records and other documents for the purpose of billing. As a medical assistant, you will have to keep in mind that insurance companies and physicians rely on accurate records. Thus medical assistants need to be accurate when taking vital signs or recording other relevant patient information. As a medical assistant, you would be expected to present and discuss the patient’s information with various medical personnel, such as doctors and physicians. You as medical assistant may encounter various situations where you may have to interact with patients that are in pain, distress or trauma etc. In these situations you will have to act in a professional, calm and composed manner. In the capacity of a medical assistant, you must have the basic working knowledge of clinical equipment and tools. This is essential for checking a patient’s vital signs, such as blood pressure, pulse checking and heart rate etc. Taking the patient’s blood and preparing it for laboratory use and tests. Administer injections to patients as prescribed by the doctor. Medical assistants record and take a patients personal information and medical history. As a medical assistant, you must ensure that this information is kept confidential and discuss it only with those medical personnel that are involved directly with the treatment of the patient. In this modern world, electronic health records (EHRs) systems are rapidly changing the dynamics of a medical assistant’s tasks and responsibilities. Increasing numbers of physicians and doctors are adopting EHRs, transferring all their patients’ medical records and information to the online system. Medical assistants need to educate themselves about the EHR software that the office they are working in is using. How to become a Medical Assistant in Texas? To become a Medical Assistant in Texas, you should preferably have a high school diploma or an equivalent GED certificate. There are no mandatory educational requirements. Most medical assistants receive training on the job. However, many employers prefer hiring medical assistants holding a Commission on Accreditation of Allied Health Education Programs or Accrediting Bureau of Health Education Schools certification. After that, you can take the Certified Medical Assistant exam administered by the National Board of Medical Examiners. How to become a Medical Assistant in California? To become a Medical Assistant in California, you need a high school diploma or an equivalent GED certificate. No specific educational requirements need to be fulfilled. Entry level medical assistants receive training on the job. However, employers prefer hiring individuals who hold a Medical Board of California-approved certification like the Accrediting Bureau of Health Education Schools or Commission on Accreditation of Allied Health Education Programs qualification. You can then take the California Certified Medical Assistant exam from the California Certifying Board of Medical Assistants. How to become medical assistant? What degree do you need to become a medical assistant? What do medical assistant do? Q:After becoming a medical assistant, what kinds of tasks will I be responsible for? Q:After I become a medical assistant, where will I work? Q:How long does it take to become a medical assistant? Q:How to become a certified medical assistant? Q:How to become medical assistant? Q:What degree do you need to become a medical assistant? Q:What do medical assistant do? Q:Why become a medical assistant? Q:Where can a medical assistant work? A:Medical assistants provide support services to physicians and work in the healthcare industry. According to the US Bureau of Labor Statistics, in 2012, medical assistants held approximately 560,800 jobs. A majority of these professionals were employed in physicians' offices, clinical, and other healthcare facilities. The demand for medical assistants is expected to grow in the coming few years.